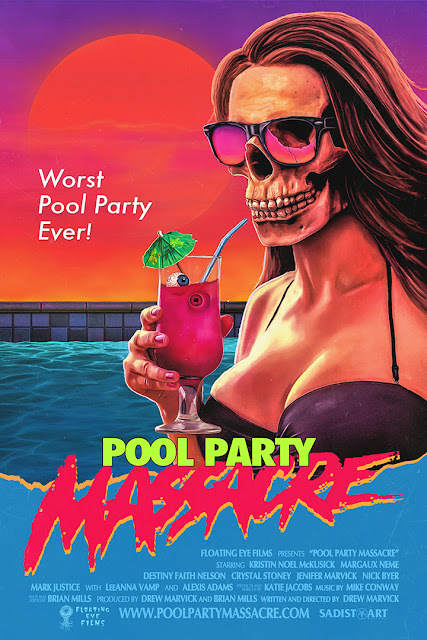 Floating Eye Films has released the first trailer and stills for the old school splatterfest POOL PARTY MASSACRE. The debut feature from horror fanatic Drew Marvick, POOL PARTY MASSACRE is an ultra low-budget 80's-inspired slasher that cuts to the flesh and bone of a group of young friends. With a pounding synth score and a heavy metal soundtrack, Marvick has crafted a loving homage to the body count of 80s B-movies. Blair Winthorpe, a high-maintenance young socialite, is having a pool party while her parents are out of town. What should have been a relaxing summer day spent tanning for the girls quickly becomes a blood soaked nightmare when an unknown guest crashes the party. He finds a garage full of dangerous toys and gets to work stalking and dismembering them one by one. Below you can check out the official poster and trailer. POOL PARTY MASSACRE is expected to premiere in 2017.